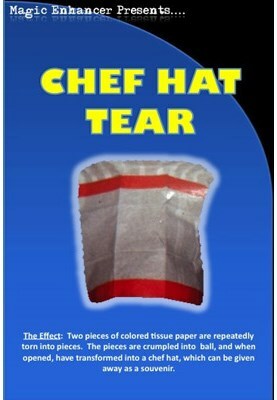 From the creator of The Amazing, Mystical, Vanishing Bandana and the Magic Enhancer CD, Magic Enhancer is proud to introduce it's newest line of hat tears! The magician invites a child from the audience to help on stage. The magician shows two different pieces of paper to the audience and gives one to the child and keeps one for him/herself. They both tear their papers in half a few times until only pieces remain and crumple them into a little ball. Next, they wave their hand over the the paper and say a magic word. The child's paper is not restored, however, the magician's paper is! Not only is it restored, but it has transformed into a chef hat that the child can wear as a souvenir.